Hiring an in-house team to design and manage your digital signage content is an expensive affair. Once a designer or team is in place, the business will be required to pay regular salaries or wages even when they may not need the services. They also need to purchase all of the computer hardware and software required to produce high quality content, which can be very expensive. This increases the operational cost of a business. With outsourced digital signage content, a business will only hire when the services are needed. There will be no need to keep a specialist when their services are not required. This cuts down on operational costs. A business will save a lot of money which would have otherwise gone towards salary, health insurance and other employee-related expenses. Don't forget that your in-house staff needs vacation time and sick days too, which can cause delays on content production. With outsourced services, a business will be dealing with experts - people who have skills and experience in dealing with digital content design and production, such as motion graphics and animation. A business will be tapping into the knowledge and skills of people who do this as their core competency. It will fill the gaps that may exist in the firm without having to employ full time digital signage content creators. A business may not have all the skills and knowledge to run it successfully themselves but can take advantage of outsourcing to an agency that specializes in digital signage content production. One of the main hindrances in production of content for marketing purposes is a lack of time and personnel. 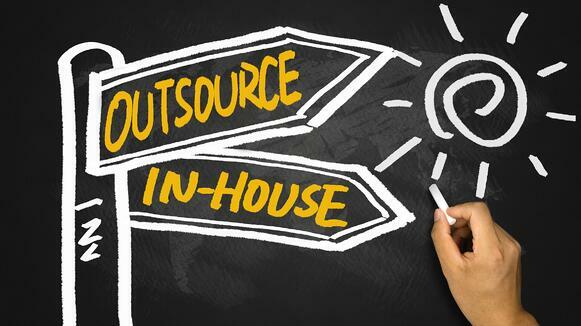 With outsourcing, the business is assured consistency in the production of content. You will never complain of not having enough workers to produce the required marketing content. With outsourcing, the business owner and staff will have more time to concentrate on the core business. They do not have to tie their time and resources into some of the activities that can be performed more efficiently and effectively by experts. Outsourcing digital signage content brings new ideas and perspective into the business. A breath of fresh air is introduced to the business, along with new challenges to help the business grow. The outsourced agency will likely have offered this same service to many other businesses. They have tried and tested the concept and they already know what works and what does not work. It will not be a trial and error – you will benefit from ideas that have worked elsewhere, further increasing the chances of success. It is not possible to have every skill that you require within a business. Outsourcing allows the business to bridge the gaps and in the course of doing so, avoid the hassle and stress of doing everything on their own. This also gives room to acquire a wide range of content. A business will get all or some of these benefits when they outsource digital signage content. With these benefits, it makes sense to adopt a practice which will add value to the business and make it more competitive.